You'll be £19.99 closer to your next £10.00 credit when you purchase The Second World War Explained. What's this? Over seventy years on the terrible events and outcome of the Second World War remains hugely relevant and important. Far from diminishing interest in this truly global conflict is increasing. The internet has enabled detailed research into ancestors’ war records to an extent unimaginable a decade or so ago. 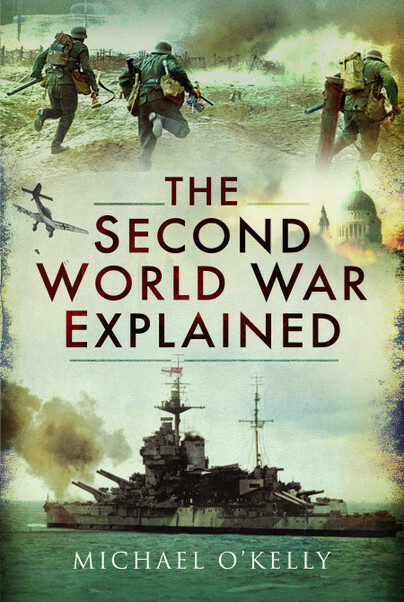 There have been countless books on all aspects of the Second world War but Michael O'Kelly has identified the need for a concise summary covering the main events and personalities. The result is a compelling, highly readable and informing book which allows an understanding of this most dramatic yet tragic period of history. Will appeal to all age groups. This is a remarkable book in which the author provides an admirable, if necessarily rather breathless and simplistic, précis of the Second World War through every theatre of War and from the Arctic Convoys to the Atom Bomb. It is a highly readable, concise summary of the main events and key personalities of the War with just sufficient detail to add interest to the narrative. In a book of this type there is inevitably ample scope for over-simplification but in general a good balance is maintained throughout despite there being a degree of devil in the detail. Recommended for the general or younger reader. Michael O’Kelly served in the Royal Navy for 34 years. He saw action in the Korean War and became an Anti-Submarine Warfare specialist. After retiring as a Captain he took up an executive position with Whitberad Plc. He was a West Sussex County Councillor for eight years. With a particular interest in education, he has been Chairman of the Governors of a large Comprehensive School and remains as a Governor today. A keen sportsman, he is a member of the MCC and used to coach. He and his wife have been married for 60 years and have four sons and twelve grandchildren. He lives near Petersfield, Hampshire where one of his sons runs an award winning independent bookshop.